Abstract: A key open problem in M-theory is the identification of the degrees of freedom that are expected to be hidden at ADE-singularities in spacetime. Comparison with the classification of D-branes by K-theory suggests that the answer must come from the right choice of generalized cohomology theory for M-branes. Here we show that real equivariant cohomotopy on superspaces is a consistent such choice, at least rationally. 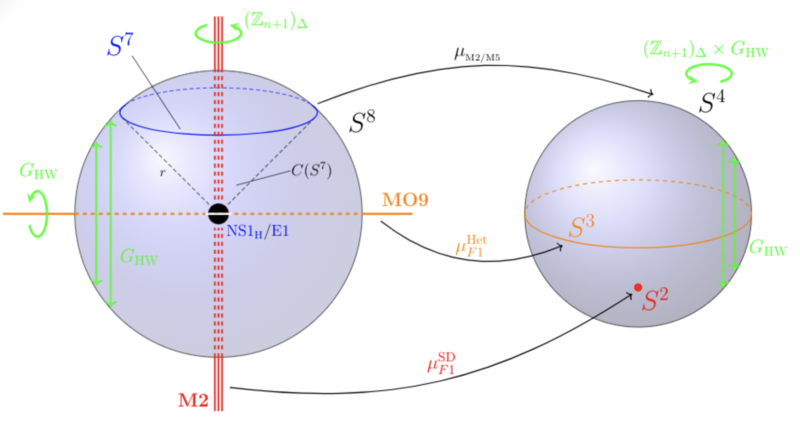 After explaining this new approach, we demonstrate how to use Elmendorf's theorem in equivariant homotopy theory to reveal ADE-singularities as part of the data of equivariant 4-sphere-valued super-cocycles on 11d super-spacetime. We classify these super-cocycles and find a detailed black brane-scan that enhances the entries of the old brane scan to cascades of fundamental brane super-cocycles on strata of intersecting black M-brane species. At each stage the full Green-Schwarz action functional for the given fundamental brane species appears, as the datum associated to the morphisms in the orbit category. The rational higher structure of M-theory. Last revised on April 18, 2019 at 08:11:03. See the history of this page for a list of all contributions to it.